The Nitra church plant began with a lot of optimism in the midst of a grand worldwide church planting push coming up to the year 2000. The largest church in our denomination sent a small team to Nitra, a city of about 80,000 with a strong Catholic tradition. A busload of believers came to hand out literature to every single home in the city. There was a week of tent evangelism in the summer of 1996. The church planters followed up with a personal visit to every family or individual that expressed interest. All that investment of time and money saw the fruit of just one family of four who joined the fledgling gospel community. Much more fruit came through summer English camps that began in 1997. Each year someone from the camp expressed interest in finding out more about God. Weekly English clubs helped connect them to the church planting team on a regular basis and gradually there were enough people to begin Sunday services. By the time Jana and I arrived in 2001 there was a congregation of about 20 people with half of us from the church planting team. 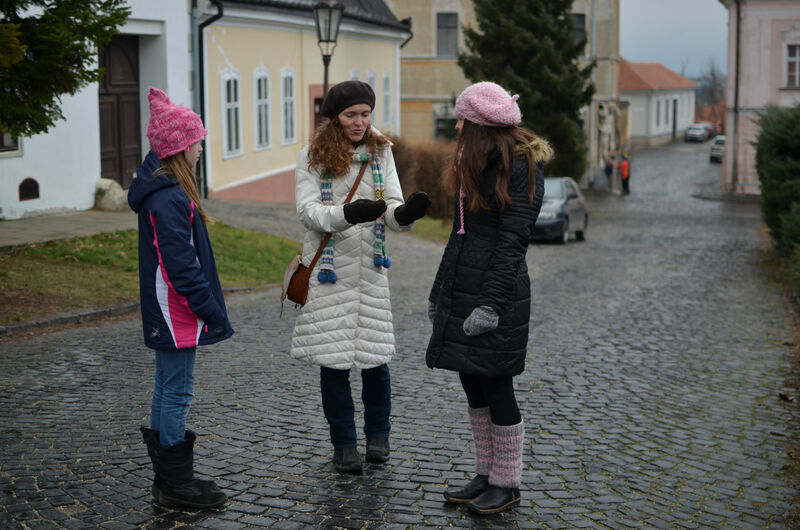 Jana and Elisabeth talk with a former member of one of our small groups for seekers. Through the summer English camps, weekly clubs, small groups, and periodic evangelistic efforts, there was a steady, slow stream of new believers. But as new believers arrived, others moved off to college or sought work in the European Union or elsewhere in Slovakia. The numbers hovered around 20 for a long time. We began to realize that the strategy we used to start the church in Nitra was not well suited for Nitra or probably for Slovakia period. Rather than starting with a small team and emphasizing “cold call” evangelism, it would be better to start with a team large enough to sustain itself and made up of people who are solid in their faith and willing to serve. Gradually the team began to transition. As Jana and I left for the States, young Slovak families moved to Nitra to bolster the core. A new leadership team was established that began to collaborate with various church planting training programs (like M4 Europe or SOMA). At the same time, the CB began to make church planting and church health a priority for the denomination. This led to the development of the 10-10-10 by 10 goal. That is, the planting of 10 new churches, the establishment of 10 new gospel communities and 10 newly trained church planting leaders in 10 years (2026). Back in Nitra, the new team began to realize that they had become occupied with programs rather than people. They made another shift. They stopped their programs and started focusing on sharing God’s story with their neighbors and coworkers. I also think it’s important that this team of leaders adopted a clear biblical theology based articulation of the story of Scripture. That helps them share the gospel more clearly. It also helps them focus their priorities and creates a more stable environment for new believers to grow in their faith. I find a lot of encouragement in the Nitra congregation. First, and most obviously, there was a time when it looked like the Nitra church plant was ready for burial. Instead, God provided new leaders, new gifts and new strategies at just the right time. Second, rather than giving up on church planting, the CB denomination learned from Nitra’s rough start and came out with a clearer strategy and an even greater commitment. Third, there are a lot of people with a lot of different gifts that contribute to what we see happening in Nitra and all of Slovakia. There’s that pioneering team, the new young leaders and their core group, missionary mentors and mentors from the Czech CB, from SOMA and M4. In a sense, everyone was doing their thing but God was coordinating it to build his church. Fourth, and similarly, there are the simultaneous church planting efforts happening in various other places in Slovakia including Žilina, Košice or Svätý Jur. Those efforts were also started as uncoordinated projects and yet without them we wouldn’t see the beginnings of the movement we see now. This, again, is God building his church. Fifth, the movement is spreading beyond our denomination. The Baptists in Slovakia are putting more focus and effort on church planting using some of the same tools the CB has tapped into. This raises an important question for me and our ministry. The reason I’m at the seminary is to help train the next generation of pastors for the church in Slovakia. But this generation of church planters is not likely to be seminary trained since church planters in Slovakia (so far) tend to be multi-vocational. If I want to be a part of what God is doing in Slovakia then I need to think carefully about how God wants me to be a part of this movement.